New to using conversion tools? The Essential plan includes everything you need to get started. Double the landing pages, popups, and sticky bars of the Essential plan, plus client sub-accounts, premium integrations, and better conversion tools. Enterprise plans are custom-built to suit your needs, with a Launch Specialist and Success Manager to maximize your ROI. All pricing in USD, and you won't be billed until after your 14-day trial expires. You can change plans or cancel your account at any time. Checking out the Enterprise plans? Ask us about Launch Sessions and custom template re-creation. Unbounce is a fully GDPR compliant platform by design. Easily build, edit and customize — no coding required. Learn More ❯ Easily build, edit and customize — no coding required. 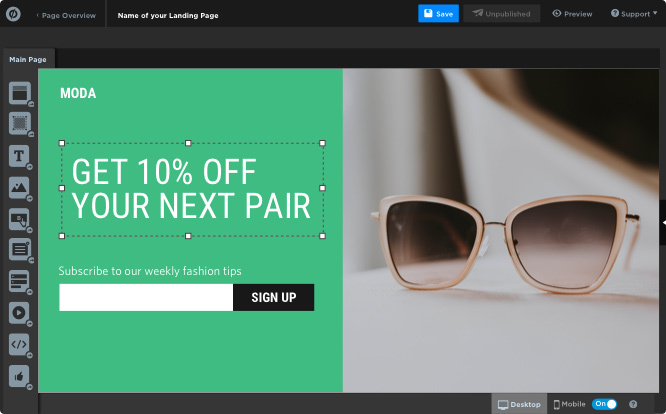 Use tools like popups and sticky bars to drive more conversions on every page. 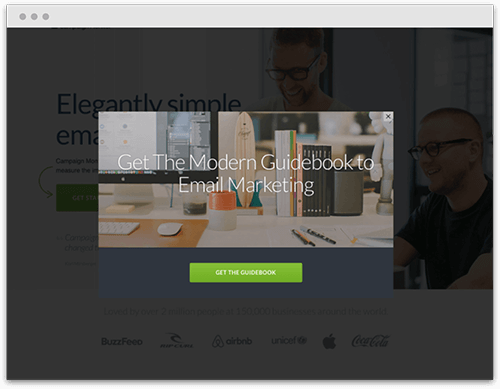 Use tools like popups and sticky bars to drive more conversions on every page. Choose from 125+ fully customizable templates, or start from scratch. Learn More ❯ Choose from 125+ customizable templates, or start from scratch. Integrate with tools like WordPress, MailChimp and Google Analytics. Learn More ❯ Integrate with tools like WordPress, MailChimp and AWeber. The maximum number of landing pages you can have published at any given time. You can create an unlimited number of landing pages in your account, but only a certain number can be published live to the web. Essential and Premium plans have a monthly traffic limit of 500,000 visitors, while Enterprise visitors vary by plan. If you need more, get in touch! The maximum number of popups and sticky bars you can have published at any given time. You can create an unlimited number in your account, but only a certain number can be published live to the web. Essential and Premium plans have a monthly traffic limit of 500,000 visitors, while Enterprise visitors vary by plan. If you need more, get in touch! If you’re serving multiple clients, Unbounce makes it easy to manage all your customers from a single account. You can group your campaigns, set multi-user permissions, and copy landing pages, popups, and sticky bars between accounts. Need multiple people to be able to access your account? All plans include unlimited users so you can add as many people as you need to build, optimize, and report. Every Unbounce plan includes unlimited domains so you can manage all of your landing pages, popups, and sticky bars in one place. DTR increases the relevancy of your PPC campaigns by inserting specific phrases according to what users are searching for. The benefits? More conversions and a better AdWords Quality Score. Unbounce protects your landing page data by automatically creating an encrypted link between server and browser. All landing pages display a green security padlock and HTTPS address, reassuring visitors that your data comes from a secure source. Unbounce is a secure conversion platform that protects you and your customers’ personal data, right out of the box. The data you collect with Unbounce is processed securely and in accordance with GDPR requirements. Sign up and log into Unbounce easily—using the Google account associated with your company. Setting up A/B tests in Unbounce is dead simple. With just a few clicks, you can split traffic between different versions of a landing page, popup, or sticky bar to see which performs better. Create lightning fast mobile landing pages using the Accelerated Mobile Pages (AMP) framework. AMP can improve visitor engagement and create better mobile ad performance. Automatically implement a ton of Google's PageSpeed best practices across all Unbounce landing pages. We take care of the technical elements, so you don't have to. Automate all your mundane and repetitive tasks! Connect Unbounce to 60+ apps with the built-in set of Integrations Powered by Zapier, and to over 900+ apps in total through Zapier's interface. Access more than 550,000 copyright-free images from Unsplash and add them to your landing page directly from the Unbounce Builder. You can publish Unbounce landing pages to any WordPress site with just a few clicks; no DNS record or CNAME setup required. Just install the plugin and start publishing. Unbounce includes a built-in HubSpot integration that can be set up in less than 5 minutes. This integration allows you to instantly send Unbounce leads to any HubSpot campaign. 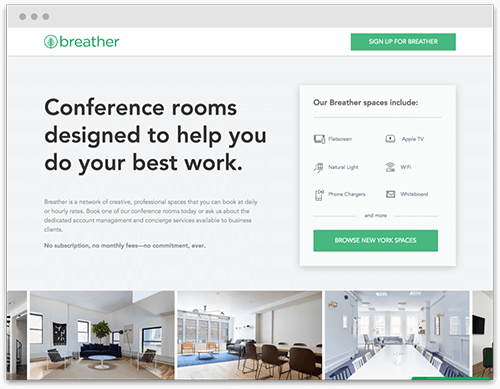 Unbounce includes a built-in Infusionsoft integration that can be set up in less than 5 minutes. This integration allows your Unbounce leads to be automatically sent to any Infusionsoft campaign. Unbounce includes a built-in Marketo integration that can be set up in less than 5 minutes. This integration allows your Unbounce leads to be automatically sent to any Marketo campaign. Unbounce includes a built-in Salesforce integration that can be set up in less than 5 minutes. This integration allows your Unbounce leads to be automatically sent to Salesforce. Gives you sophisticated options for showing/hiding popups and sticky bars, such as referral targeting, cookie targeting, and country/region/city targeting. Don't stay up late on the weekend. Stay organized and schedule your popups and sticky bars in advance so they can launch even when you're not at work! Redirect traffic from your unpublished landing pages to any URL of your choice. Types available: 301, 302 or 307. Extra security: in addition to knowing the password, this feature allows you to require that your mobile device be used to log in. Not only do you have a record of user activity in your account, you can also easily export reports in case you need to review any incidents. Success Managers are a dedicated touchpoint for strategy and insight. Your Manager will give you 1-on-1 advice, guide you through advanced training, and ensure you have VIP access to new features. 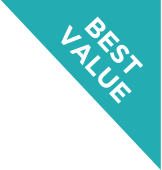 Launch Specialists are all about helping you see value quickly. Your Specialist will guide you through setup and early training sessions. Join us for an epic event with actionable insights from the world's leading marketing and optimization experts. Learn more about CTAConf. Easily scale out your marketing campaigns and get started quickly. The Unbounce Launch Team can help rebuild your current landing pages or popups in Unbounce using the flexible design features in the builder. Essential and Premium plans have a monthly traffic limit of 500,000 visitors. Enterprise visitors vary by plan. Available 5am-midnight PST weekdays; 9am-9pm PST weekends. "I was able to perfectly recreate my Photoshop mock-up in under an hour." 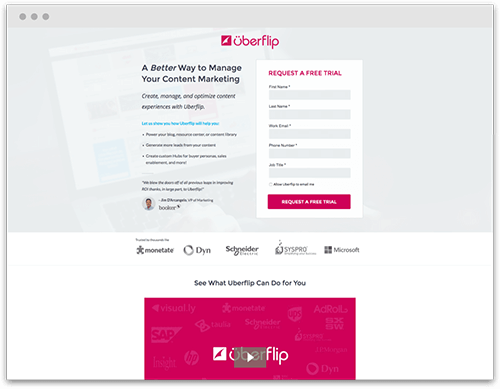 "Unbounce has given us a new way to engage with our audience, provide them with valuable content, and turn them into Campaign Monitor customers." "My marketing team would revolt if I took Unbounce away from them." What’s my traffic limit? What if I exceed it? Essential and Premium plans have a monthly traffic limit of 500,000 visitors. Enterprise visitors vary by plan. If you need more, please contact us. A unique visitor is a person who views a landing page, popup, or sticky bar at least once in a given month. Using cookies, we ensure each visitor only counts once towards your traffic limit — no matter how many times they return.A unique visitor is a person who views a landing page, popup, or sticky bar at least once in a given month. Using cookies, we ensure each visitor only counts once towards your traffic limit — no matter how many times they return. What are popups and sticky bars? They’re targeted tools you can launch on top of any web page, each with a dedicated call to action. Customizable triggers and targeting rules give you complete control over who sees them and when, so you can serve the most relevant offers to the right audience. You get full access to the Unbounce Platform during your 14-day trial. There are no restrictions, and no obligation to continue beyond your trial. You won’t be charged until your 15th day using Unbounce. To cancel your trial, go to your account dashboard and click “Manage Account.”You get full access to the Unbounce Platform during your 14-day trial. There are no restrictions, and no obligation to continue beyond your trial. You won’t be charged until your 15th day using Unbounce. Annual plans are billed as a single payment once per year at a discount of 20%. Monthly plans are billed at the beginning of each month, and are not discounted.Annual plans are billed as a single payment once per year at a discount of 20%. Monthly plans are billed at the beginning of each month, and are not discounted. You can easily change plans via your account dashboard. You’re welcome to upgrade your plan at any time, and downgrade effective at the end of your current billing cycle (either annually or monthly).You can easily change plans via your account dashboard. You’re welcome to upgrade your plan at any time, and downgrade effective at the end of your current billing cycle (either annually or monthly)..
Unbounce takes our customers’ data privacy and security very seriously. Unbounce is a fully GDPR compliant platform by design. Why is GDPR compliance so important to Unbounce? GDPR compliance will ensure we continue to deliver an industry-leading conversion platform for professional marketers in the European Union (EU), and marketers who conduct business with EU based individuals.